Our noise monitoring solutions range from sound level meters with weather protection to long term noise monitors with remote access and automatic web server upload. For advice on the most suitable system for your applications, please email or call. We have lots of experience with such systems and will be able to offer useful guidance. These kits consist of a hand-held sound level meter enclosed in a portable weatherproof case and supplied with a suitable Outdoor Microphone. These noise kits are ideal for unattended monitoring for up to a week and for moving easily between different locations. 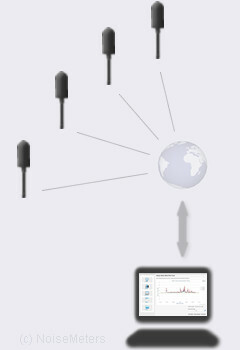 One or more noise monitors connected to your network over a standard WiFi link or Ethernet connection. Software is included to show the live noise levels at each noise monitor's location and to produce noise reports over daily, weekly, monthly and custom periods. One or more of these remote monitors can be used for longer term boundary and remote noise monitoring applications. They upload their measurements to a web server over the mobile phone system. The results are viewed using a standard web browser. A portable version of the Environmental Noise Monitor that comes in a weatherproof carrying case with a 7-day rechargeable battery pack for unattended noise monitoring. The measurements are uploaded to a web server for viewing and reporting in a web browser. A medium to long term environmental monitor for noise, dust (particulate) and ground vibration. This unit can be fitted with just one or all three sensors. It connects to the Internet over mobile data network and reports can be viewed in a web browser on a cloud server.